The Lochnagar Crater is now preserved as a First World War memorial. 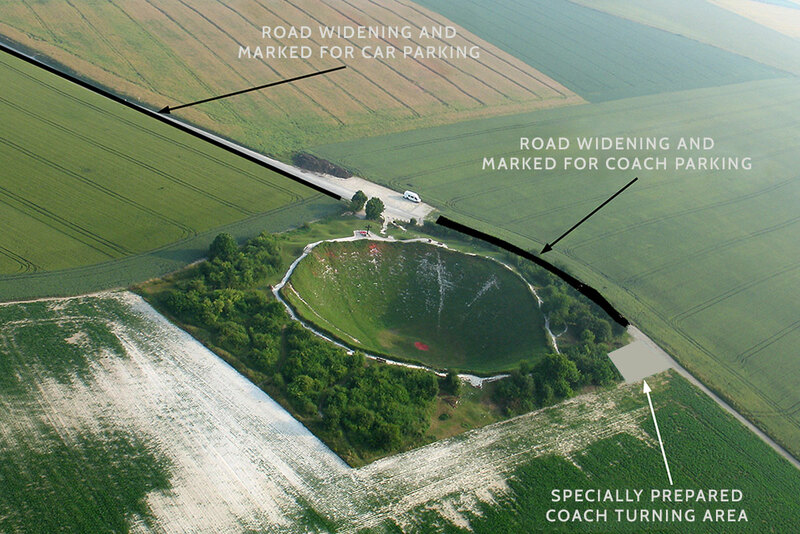 As such it is essential the fabric and integrity of the Crater is preserved and visitors must take note and be aware, that anyone entering the Lochnagar Crater site does so at their own risk. 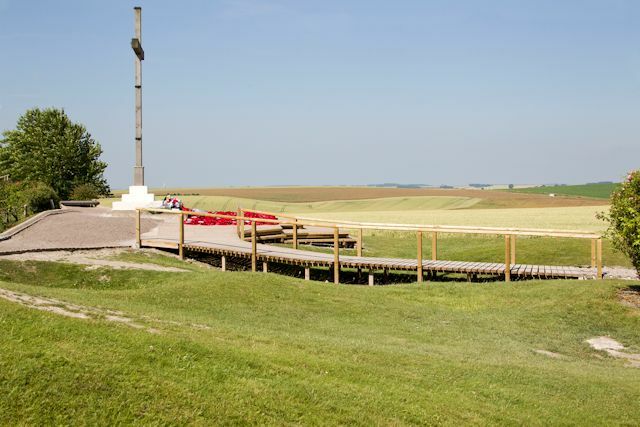 The Lochnagar Crater is within the Commune of Ovillers-la Boisselle and is located close to the village of La Boisselle to the south of the D929 between the town of Albert and the village of Pozières. On arrival at La Boisselle look out for the signs to the La Grande Mine. the Crater is south south-east of the village a short way along a no through road. To use Google Street View click on the words ‘View Larger Map’ then click and drag the little yellow man (top left) to the red marker, centre the green zone at the point of the tail of the red marker. You can then rotate the image by click and dragging the N (for north) in the circle at the top left of the map to about south south east. If necessary move up and down the road by moving the yellow man in the inset map box (or click on the white arrows on the white line in the main image). Clean up after and keep close control of dogs. Please note there are NO public toilet facilities at the Crater or in La Boisselle village, but of course the local cafés have facilities for their customers. (On-site toilets are available at the Crater on event days). Quite often there is a refreshment and souvenir stall near the Crater. Please note this is privately owned and run and has no connection with Richard Dunning or The Friends of Lochnagar Crater. THE LOCHNAGAR CRATER FOUNDATION GREATLY APPRECIATES THE CONTINUED SUPPORT OF THE HISTORIAL DE LA GRANDE GUERRE, PERONNE . A 200m length of the lane has been widened by 3m to provide clearly marked parking spaces for coaches and cars. 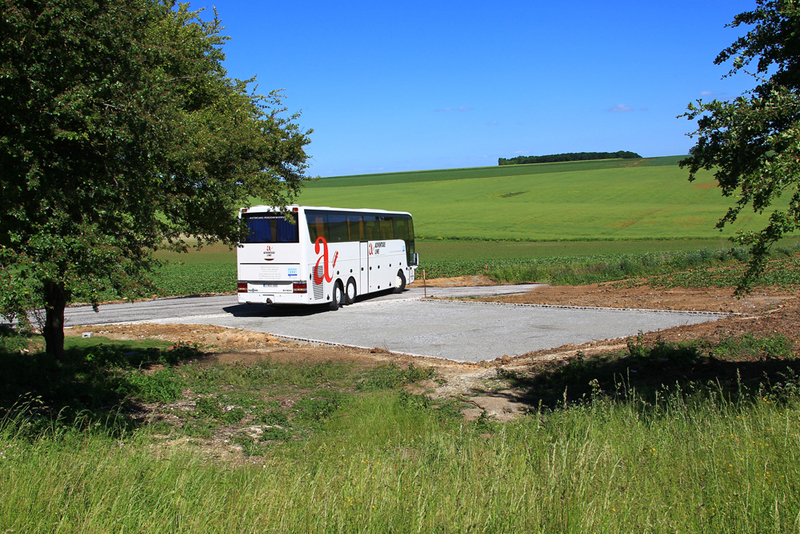 To assist tour companies and coach drivers, Richard Dunning MBE, the owner of the Crater, has very generously provided a corner of the Crater site to enable coaches to turn. See picture below. A wooden walkway has been provided around the 300 metre circumference of the rim of the Crater but is not suitable for wheelchair access or people with restricted mobility. However there is a wheelchair friendly ramp from the Crater entrance to the cross. The Crater is privately owned by Richard Dunning but ALL the land surrounding and opposite the Crater, is privately owned by French farmers. NO VISITOR TO the Crater SHOULD ENTER THE LAND ADJACENT TO the Crater WITHOUT THE PERMISSION OF THE FARMER. This site is privately owned, free of charge and open to visitors during daylight hours. Please treat this place with respect in remembrance of those who died here. Please help preserve Lochnagar – unauthorised entry down into the crater itself is strictly forbidden. Please take care on walkways and grass areas, particularly when wet. No commercial filming or photography is permitted without prior written consent. No profit has, nor ever will be made from Lochnagar. Wartime relics, such as shells, bullets and grenades are often in a dangerous condition, and even after all these years can still cause death and injury. Any found during visits to the battlefields should be left alone. Most of the land is private property and must be respected as such. Strict laws apply in respect of the collection and export of battlefield detritus. Hotel de la Paix. Albert, Somme. Hotel Royal Picardy Hotel Albert, Somme. Les Alouettes B&B. Hardecourt aux Bois, Somme. No 56 B&B. La Boisselle, Somme.